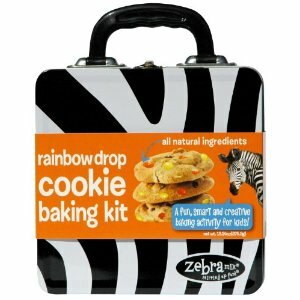 All-natural and delicious, the Rainbow Drop Cookie baking activity kit for kids includes cookie mix with colorful chocolate drops and arrives packaged in a fun and reusable Zebra striped lunch box. Way more than a stir-n-bake, Zebra Mix turn baking into an adventure with their award-winning Safari Baking Map instructions that puts kids in the center of the making and baking process where the real fun (and learning) begins. Makes 24 cookies. Zebra Mix baking kits for kids is a new concept in kids’ food. It is both a delicious, organic food and an interactive kids’ activity. Delicious cookies with colorful chocolate drops. The Rainbow Drop Cookie Kit includes: Cookie Mix & Chocolate Rainbow Drops Safari Baking Mat Safari Elephant All packed in a fun, reusable tin lunch box Each baking kit has on oversized Safari Baking Map with two levels of learning. Level 1 (age 4-9) is for non-readers, beginning readers, experienced reader. Level 2 is for ages 9 and up. Each level has aspirational learning and appeals to a variety of learning styles. Using pictures, colorful illustrations and icons kids will explore their five senses through a series of activities that includes a fun sensory science experiment and more. The large, foldout Safari Baking Map visually engages kids through every step of the baking process. Filled with an entertaining mix of art, science, math and hands on learning activities, Zebra Mix is a fun, educational and creative adventure for kids. Each map is double sided with two levels of intructions and learning activities. Each kit includes all the organic and natural dry ingredients to stir up tasty treats; just add fresh eggs and butter. All products certified 70% organic by QAI.